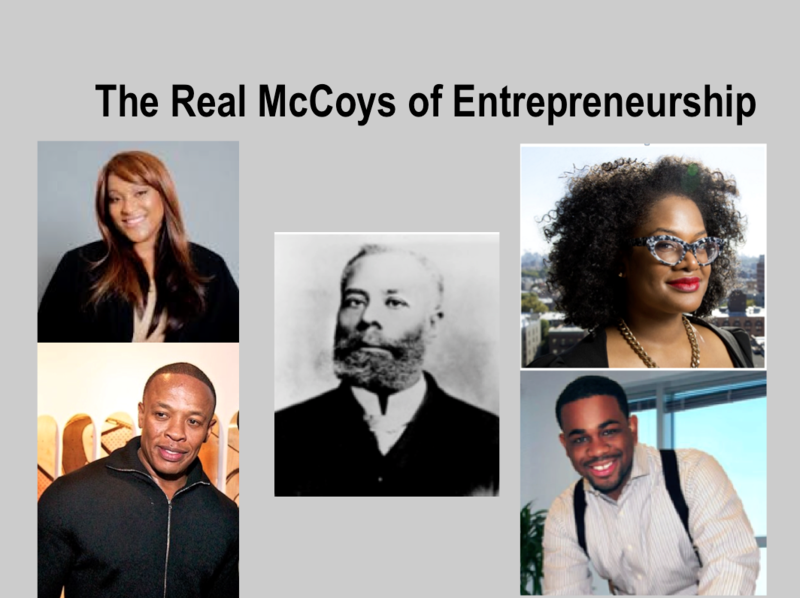 “The Real McCoys of Entrepreneurship,” five extraordinary people and entrepreneurs, have paved the way for others to follow their dreams. One entrepreneur comes from the pages of history, and four others are history-in-the-making entrepreneurs that live among us today. Elijah McCoy, who lived from 1844 to 1929, was a Canadian engineer and inventor. He left behind 57 U.S. patents, 50 of which dealt with steam engine lubrication. His parents, who escaped slavery in Kentucky via the Underground Railroad, gave their children the gift of freedom at birth. Perhaps they also passed down determination and an adventuresome spirit, for at the age of 15, McCoy went to Edinburgh, Scotland to become certified as a mechanical engineer. When he returned home, he faced the racial barriers of the time and could only find work with the Michigan Central Railroad as a fireman and an oiler. However, Elijah overcame the discrimination against the placement of African- Americans into skilled positions by studying the inefficiencies of engine lubrication. He invented a lubricating cup that distributed oil evenly over the moving parts of an engine. His invention improved the industry by allowing the steam engines of locomotives and ships to run for longer periods without continuously needing to stop for maintenance. By age 65, Elijah was recognized in Booker T. Washington’s Story of the Negrofor producing more patents than any other black inventor up to that time. He continued inventing until late in his life. Camille Newman entered the plus-size fashion market – not because Bloomberg valued the industry at $17.5 billion – but because the pain point in the market was a very personal one for her. Camille suffered through the message of the fashion world: If you’re not skinny and tall, you can’t be fashionable, and women with fuller, curvy figures should not enjoy shape-wear. Camille personally experienced this blow to her self-esteem by spending hours at the mall only to leave empty-handed because of so few choices for plus-size women. With a social media marketing strategy to an international market that includes the U.S., London and Australia, Camille’s focus is on her customers’ lifestyles. She wants to give women the opportunity to take a fashion risk, show their creative side with their clothes, and be comfortable and trendy at the same time. Camille is an entrepreneur to watch as she continues to press on. The 2014 winner of Facebook’s Business All-Stars Competition and the 2015 winner of the Black Enterprise Elevator Pitch Contest, she is now working on her first private label collection for this spring of 2016. Andre Young is widely known for his fame in the entertainment industry as music producer and rapper –Dr. Dre – an alias he adopted circa 1985 when he referred to himself as a “Master of Mixology.” In addition to being a successful musician entrepreneur, he also became the cofounder of “Beats by Dr. Dre Studio headphones” in 2008. Though mobile phone manufacturer HTC acquired a 50.1% majority of Beats for $309 million in 2010, Beats operated as an autonomous company. The product line expanded to include Beats Executive noise-cancelling headphones and the Beats Pill wireless speaker. After a series of transitions in the company, Apple acquired Beats Electronics for $3 billion in August 2014. This was apparently a “good match” due to the fact that Beats modeled itself after Apple’s knack for marrying culture and technology in their product designs. Kathryn Finney is the Founder and Managing Director of digitalundivided (DID), a social enterprise that invests where others will not – in Black and Latina women founders. An honors graduate of Yale University and Rutgers University, she is the recipient of the 2013 Champion of Change Award, an Eisenhower Fellow, and is listed in Marie Claire’s 10 Women to Watch in 2016. Kathryn has numerous other accomplishments and recognitions. Kathryn is also the passionate tech entrepreneur and angel investor behindProject Diane, a year-long study that illuminated the state of black women in tech. Her study builds a strong message about the need to fund black-women-led startups and answers the need to show that while black women are the fastest growing group of entrepreneurs in the U.S., they only receive a pittance of the funding. Project Diane looked at 60,000 startups and found only 88 that were led by black women. When it comes to funding, the picture is even bleaker. Of those 88 startups, only 11 have raised over $1 million in outside funding. Margot Dorfman, CEO of the U.S. Women’s Chamber of Commerce, said, “Women of color, when you look at the statistics are impacted more significantly by all of the negative factors that women face. It’s not surprising that they have chosen to invest in themselves.” Kathryn Finney is a great champion of the cause. Recognized by Inside Business magazine as a “Top 40 Under 40” recipient,Devon Henry has received many awards and acknowledgements for his contributions to the community at large. A graduate of The Tuck School of Business at Dartmouth, Devon is CEO and President of Team Henry Enterprises, LLC. Devon founded the company in 2006 with the acquisition of a 20-year-old company that specialized in erosion control application. Devon accelerated the company’s growth by maximizing the capabilities of his initial staff and by bringing on new talent. This enabled him to expand the company’s services to include environmental remediation, wetlands mitigation, demolition, site development and road building. In 2007, Devon moved Team Henry to new headquarters in Newport News, VA to take advantage of federal contracting opportunities. By serving agencies like the US Army Corps of Engineers, the National Park Services, the US Geological Survey and Federal Aviation Administration and others, Team Henry has continued to grow and expand with satellite offices in Richmond, Florida, North Carolina, and Florida. Team Henry Enterprises has been recognized for contributing to new jobs, revenue, and economic growth. In 2010, Bloomberg Business ranked Devon’s company 65th on a list of the 100 fastest growing inner city companies in the United States. Fortune magazine recognized Team Henry as the 13th fastest growing inner city company in the U.S. for both 2011 and 2012. Singled out again in 2013, Inc. magazine ranked Team Henry as the 9th fastest growing African-American-Owned company in the country. Devon’s scholastic achievements, recognitions and contributions are numerous. He is a mover and shaker for entrepreneurship within the African American community and beyond. Collectively, these entrepreneurs exemplify attributes that contribute to startup success: They identified unmet market needs, solved problems through innovation, maximized the use of the talent required to grow and expand their businesses, and have made commitments to pave the way for others through funding and education. Their stories illustrate the grit, determination and creativity that feeds success. Ed McLaughlin is the author of the upcoming book book, The Purpose Is Profit: The Truth about Starting and Building Your Own Business, along with Wyn Lydecker and Paul McLaughlin. They are currently offering a complimentary eCopy of The Startup Roadmap: 21 Steps to Profitability here.